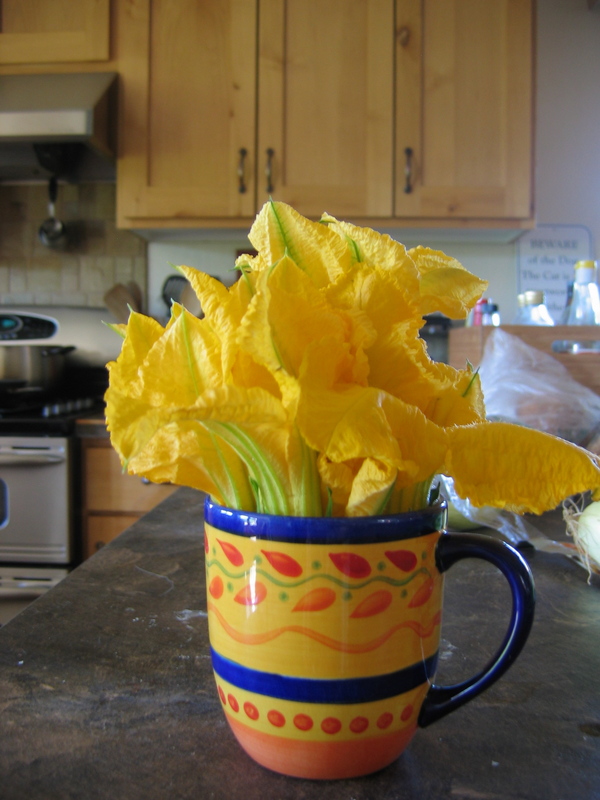 There are a lot of edible flowers, but no flower expresses the joy of summer as well as the resplendent squash blossom. The sheer exuberance of them in the garden on a July morning lifts the heart of anyone who sees them, and they are a delicious edible. They’re fragile, and your best chance of getting good ones is to grow them yourself. I like the flowers of winter squash and pumpkins best for eating. They are huge gold trumpets six or seven inches long. 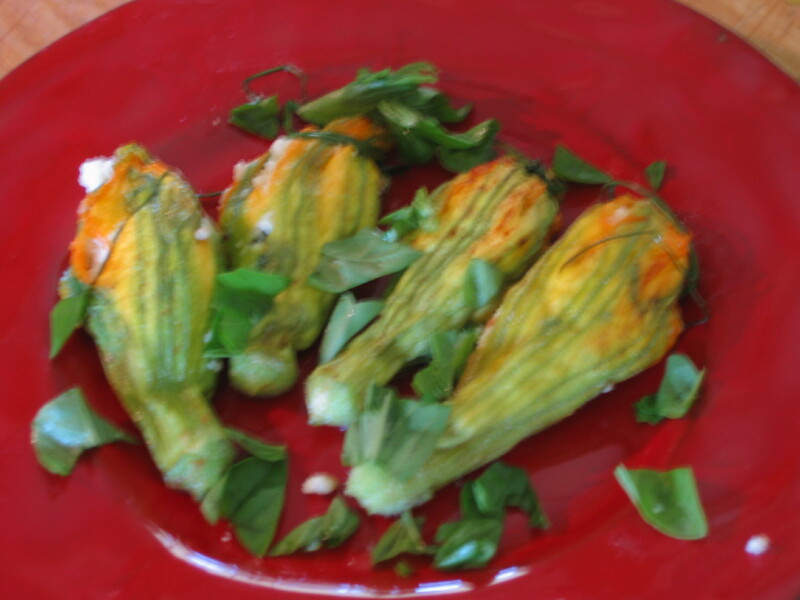 You can use the smaller flowers of zucchinis, but you’ll need almost twice as many. There are lots of ways to cook them, but my favorite method is to stuff them with a delicate ricotta and basil filling. I pick only the male flowers, making sure to leave at least one male blossom in the squash patch every day for pollination purposes. You can also use the female flowers, which have embryonic little squash between the stem and the flower, but of course you won’t get as many squash if you pick females. These flowers are wildly attractive to bees, so check for bees inside before you pick the flower, and give them a chance to escape safely out in the garden. I rinse them well and place them trumpet-down on a dish towel to drain. Some sources tell you to pick out the stamens or pistol, but I don’t think this is necessary. Just get them clean and fairly dry. Then carefully pull or snip off the six long green sepals that stick up from the base outside the petals. These have a coarse texture and detract from the delicacy of the finished dish. The blooms need to be cooked the day they are picked. To keep them from morning to evening, wrap them gently in the damp towel that they drained on, put the bundle in a plastic bag, and refrigerate until dinnertime. It’s better to use them for lunch, though. White part of one large or 2 small scallions, very finely minced. Make sure the ricotta is very fresh and free of bitterness. In a bowl, mix it with the Parmesan, minced scallion, and half the torn basil leaves. Taste the filling and add a little salt if needed, but don’t overpower the delicate flavors. Using your fingers and working very gently, fill each blossom with the cheese mixture. You will need to work a little down into each trumpet, but don’t tear them by pushing too hard. Fill each trumpet about halfway, and don’t overstuff. Now hold two long chive leaves together and tie a square knot at the end of each trumpet, and trim the ends to about 1″ long. I admit that this is a bit fiddly and not completely necessary, but the tied bundles look so attractive that I strongly recommend it. 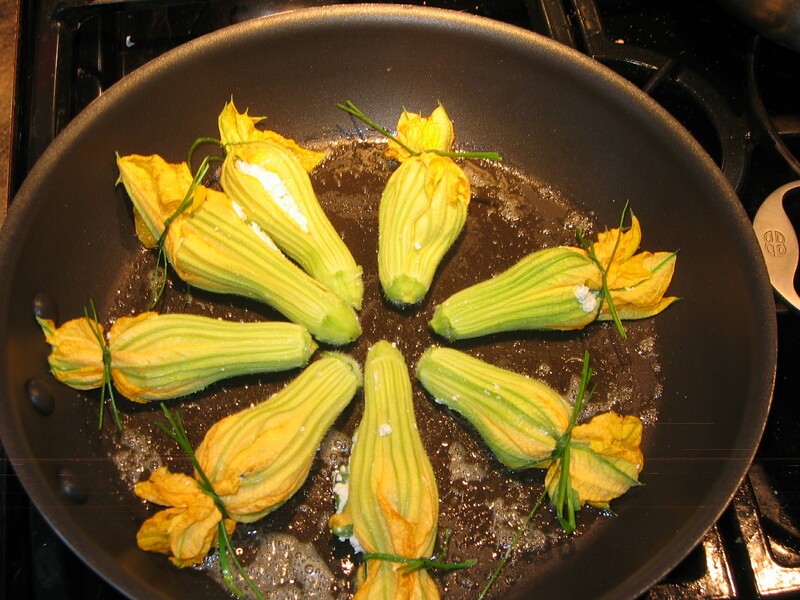 Now heat a skillet over medium heat, melt 3 tablespoons of the butter, and put in the filled blossoms. You will need to turn them about three times to get the blossoms cooked on all sides. Work very carefully with a small spatula and your fingers, so as not to tear them. Let them get slightly browned in spots but not darkened all over. The cooking usually takes me about 15 minutes. Then put them on plates, melt the remaining two tablespoons of butter in the pan and drizzle a little over each plateful, and scatter with the remaining torn basil leaves. Serve with a good baguette, and eat with gratitude for the pleasures of the season. wow, ive fried them often stuffed with different cheeses and fresh herbs and battered in tempura. they look amazing tied with a little chive though. like tying beans or asparagus in blanched leek stems. mine are filled with drunken bees now though. i checked morning and night and they’re still there! maybe i’ll clip them a leave them outside till they realize and escape..? I’ve often noticed bees in the blossoms overnight, sleeping it off presumably. I use a tiny twig or toothpick to help them get out, and let them lie on a squash leaf until they come to. One of the lovely things about having flowers in the garden is that it becomes such a haven for bees and birds. I did not know to eat squash blossoms. Will have to try that this summer. Thanks!